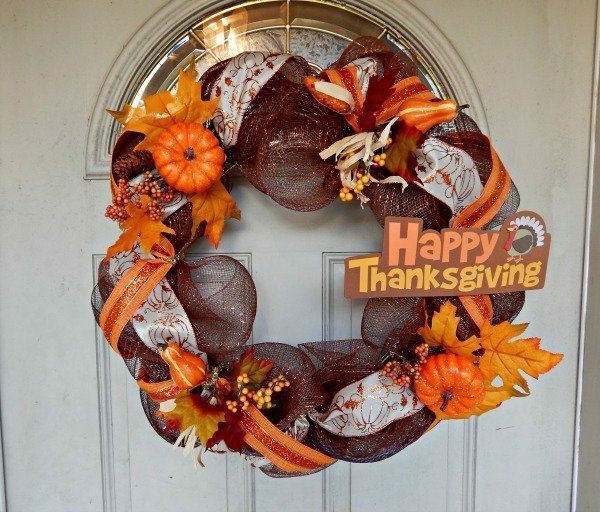 A beautiful wreath for Thanksgiving to welcome your visitors and the beginning of the holiday season is a must and we will show you some great ideas for your front door, windows or walls. Every housewife knows that the decoration adds to the festive spirit and you can easily create a unique atmosphere in your home. 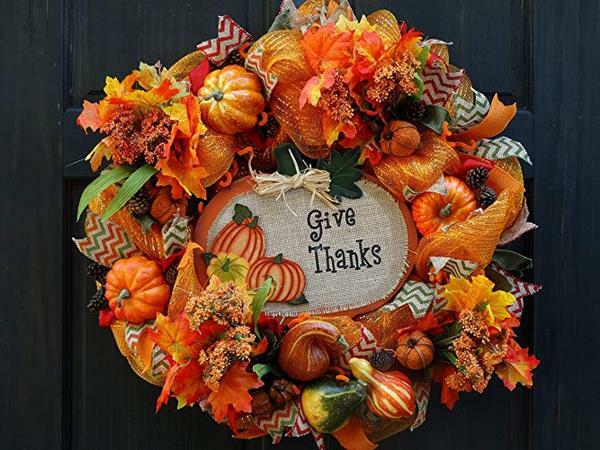 Originally, Thanksgiving Day was a religious holiday, the main purpose of which was to thank Mother Nature for the harvest and is celebrated in the fall when the harvest is gathered from the fields and gardens. Traditionally, this holiday is on the fourth Thursday of November and the whole family gathers around a big table to share a festive dinner, exchange symbolic gifts and celebrates the coming of fall. 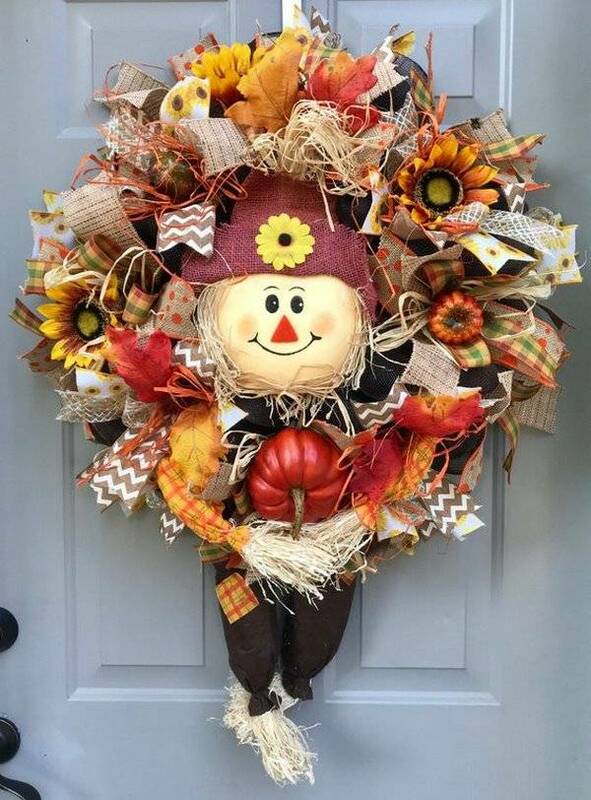 To many people, the festive mood starts with the decoration of the home and even though beautiful decorations can be bought everywhere, it is the handmade decor that brings the unique look to the overall holiday composition. Whether you prefer traditional autumn colors or alternative colors, it is best if you begin planning your festive decoration with the choice of a theme. 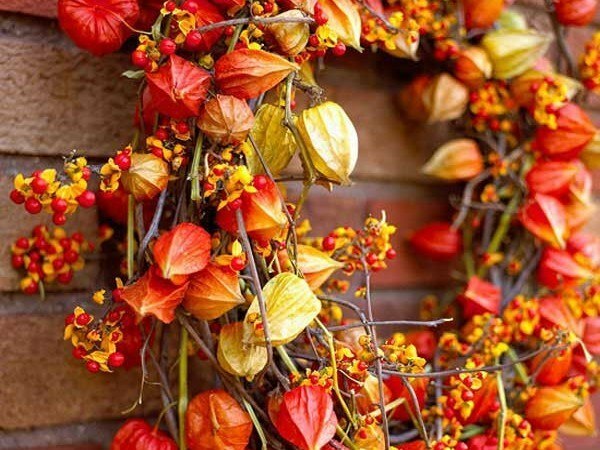 The natural theme which symbolizes the harvest and the arrival of autumn is among the most popular decoration in every home on the eve of the holiday. 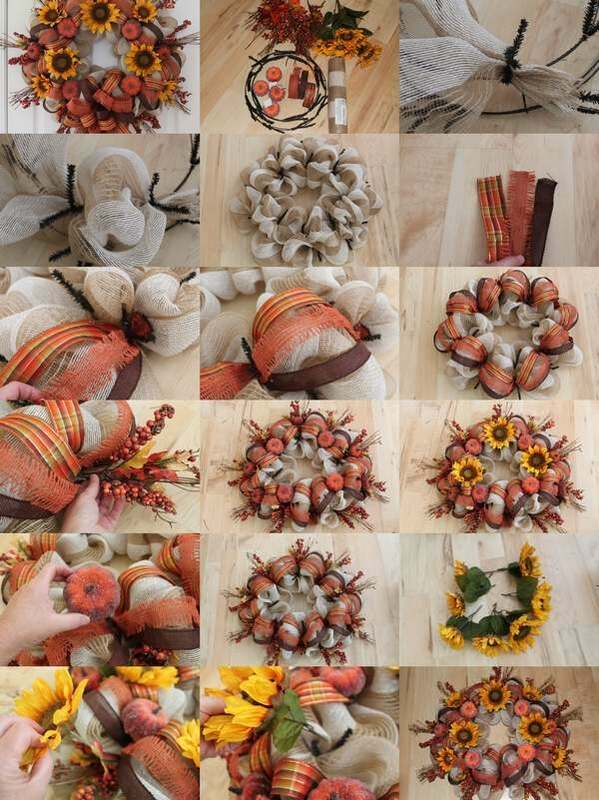 A beautiful wreath for Thanksgiving can be crafted from almost anything. Autumn is a wonderful season providing an abundance of magnificent colors and materials to work with. 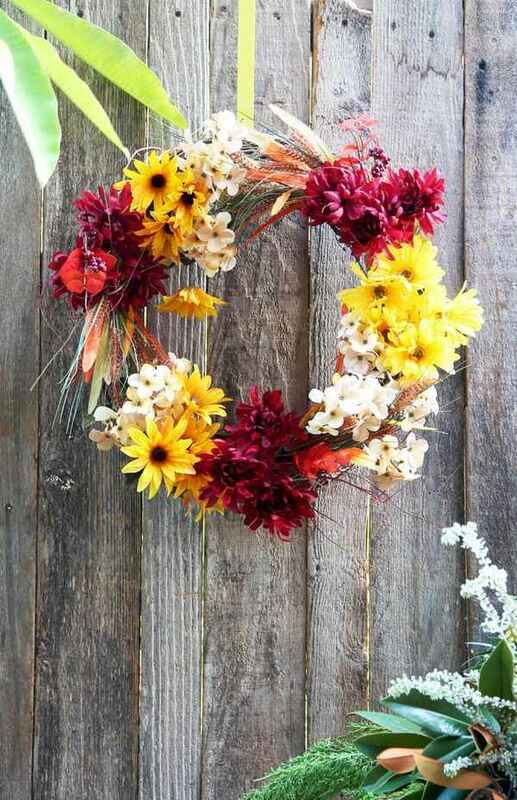 Those who prefer floral decoration can make a wreath from autumn flowers and branches. You can use dry flowers or buy fake ones from a craft store. 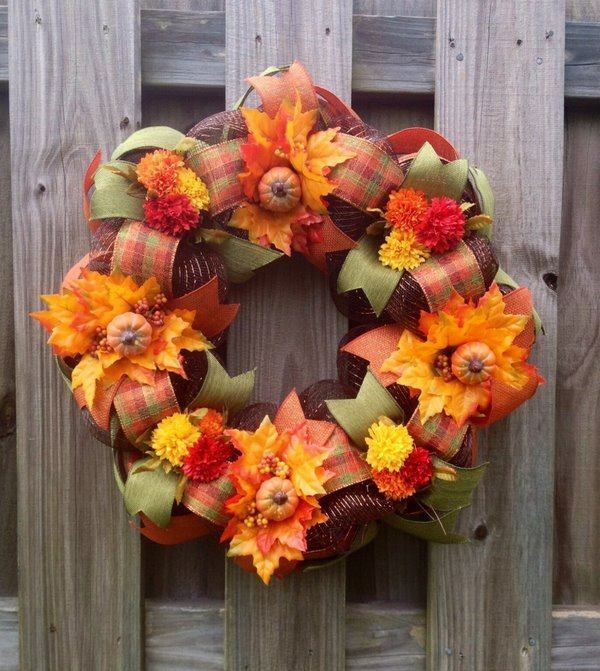 Twist some grapevines into a circle which will be the base of your Thanksgiving wreath. 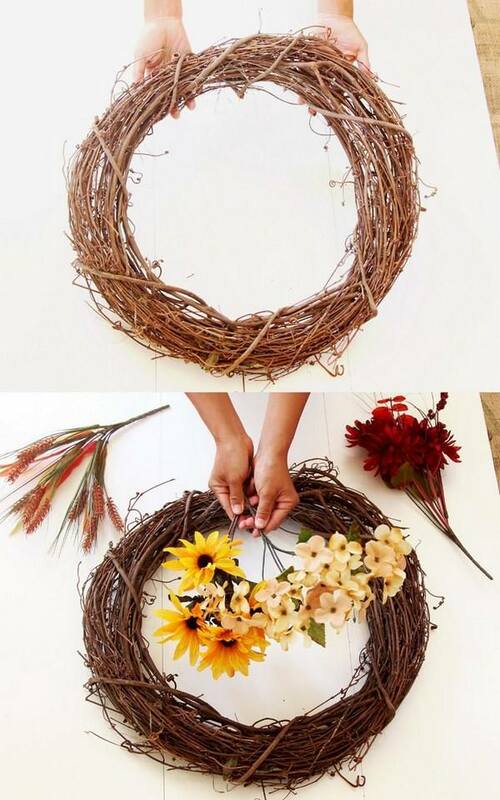 Arrange the flowers on the circular wreath by tucking the stems into the base and fix with bands. 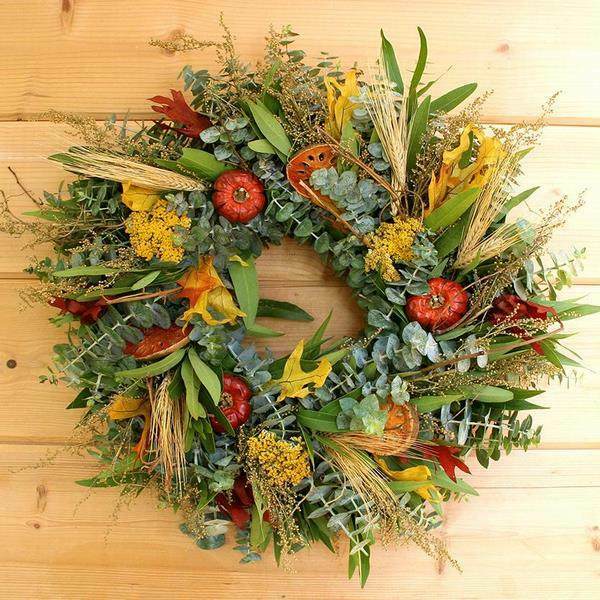 Add some evergreen foliage which can last without water and your floral wreath is ready! Insert toothpicks into the balls and cone so that they can stand while drying from the paint. Use the brown paint and dab it evenly around the large Styrofoam ball which will be the head of the turkey. 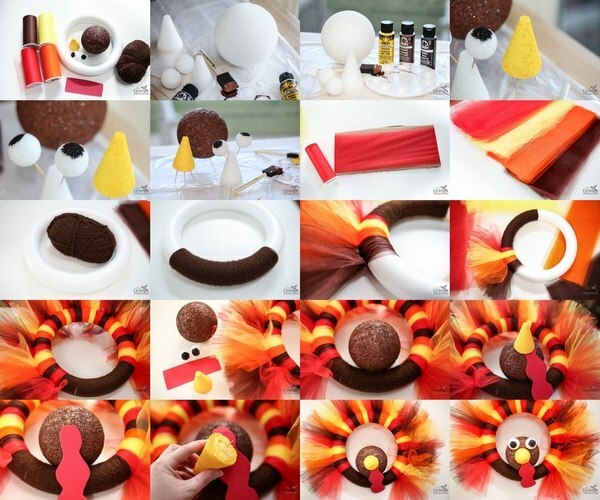 Paint the cone yellow and use the black color to paint an area on the small Styrofoam balls which will be the eyes of the turkey. Let paint dry completely. Cut the tulle to pieces of about 16-20″ in length. You will need about 30 pieces of each color. Wrap the brown yarn around the wreath. You do not have to wrap the whole base but about 1/3 of the circle. To work easier, secure the end of the yard on one end with hot glue to make sure it is fixed. When you finish wrapping the marked section, secure the end with glue again. Tie the tulle strips. You can follow a pattern of your own and place the colors in certain order or go for a random pattern. Attach all the tulle strips until all the base is covered and fluff the ends so that the strips look like feathers. Attach the head, peak and eyes of the turkey. Insert a toothpick into the brown ball and add some hot glue on the base to make sure it will be firmly fixed and insert the head into the center of the yarn section. Cut one strip of the red craft foam sheet which will be the Snood of the turkey. Attach it to the turkey head with hot glue. With the help of toothpicks and hot glue attach the beak and the eyes to the turkey head. Make a loop from a tulle strip and tie it to the wreath. 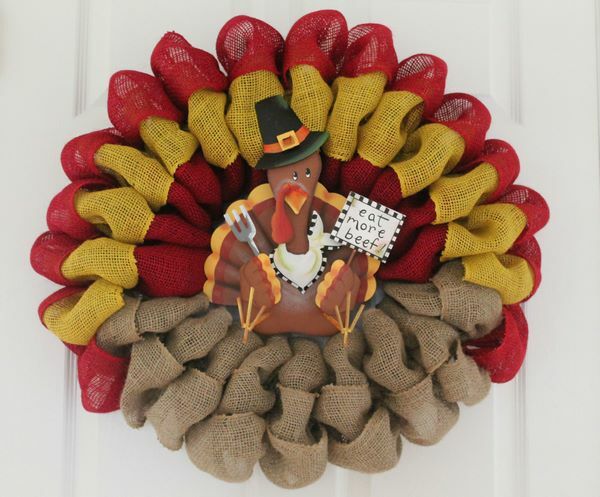 Hang your Thanksgiving wrath on the door! Fix the burlap mesh to the wreath base. Start on the inside loop and gathering the mesh every 10 inches fix it around the work wreath with wire sprigs. Repeat the same on the outside loop. Attach the ribbons. 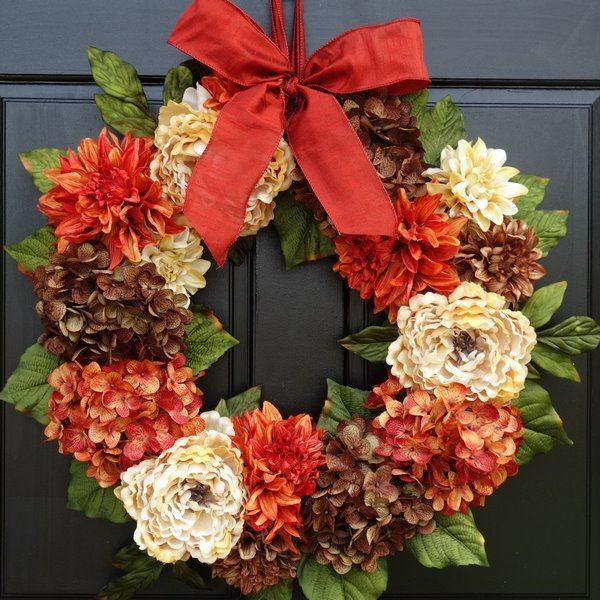 Pinch together the ends of the 3 ribbons – plaid, brown and orange – place them on the wreath and twist tightly around with sprigs. Make sure the ribbons are not tight but lay loosely on top of the mesh. Continue adding ribbons around the wreath. Add the berry picks. Put a dab of hot glue on the stem and stick it down into the mesh over the sprigs. Add the large pumpkins with the help of hot glue on the back of the pumpkins. 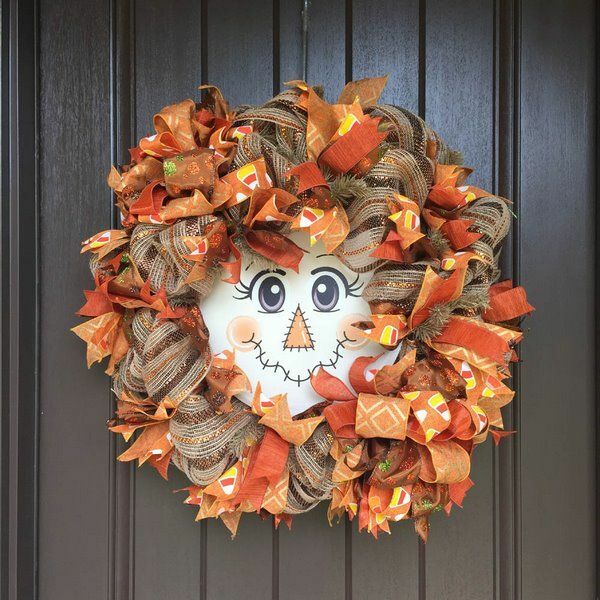 Arrange the 5 smaller pumpkins randomly around the outside of the wreath. Make sure you glue them over the top of the berry stems which make the wreath look fuller and will disguise places where the stems of the berry picks are fixed to the wreath. Add the sunflowers between the pumpkins by pushing them down the mesh. Craft a bow and attach it to the wreath with floral wire. 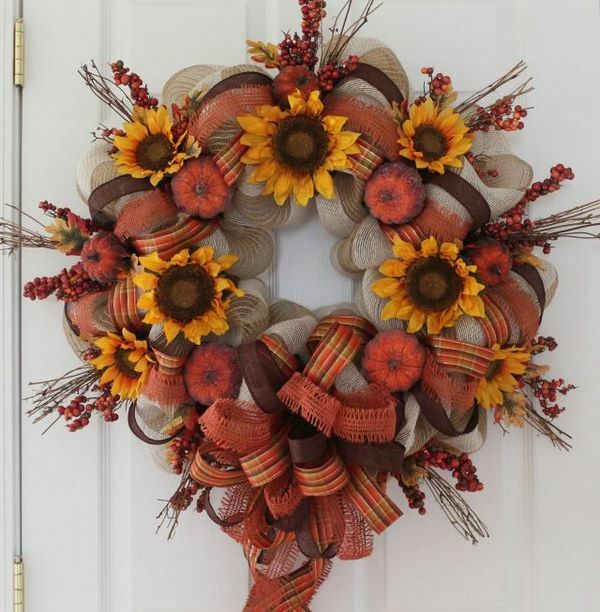 Your beautiful wreath for Thanksgiving with burlap deco mesh, pumpkins and sunflower is ready to be hung on the door! Weave a wreath from the vine which will serve as a base. 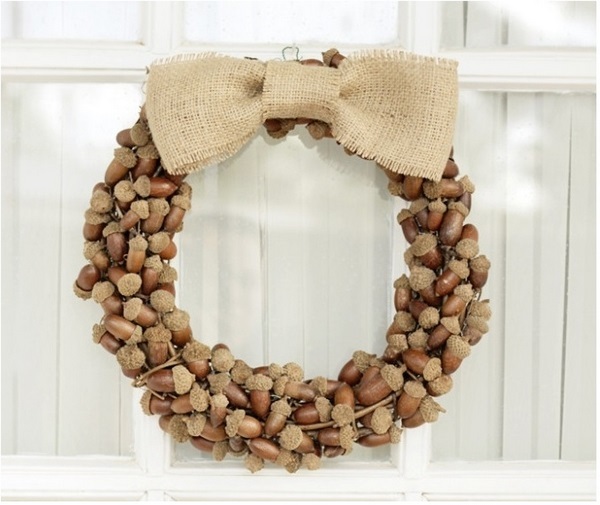 Take the acorns and with the help of a hot glue gun (or craft glue) stick the acorns to the wreath. 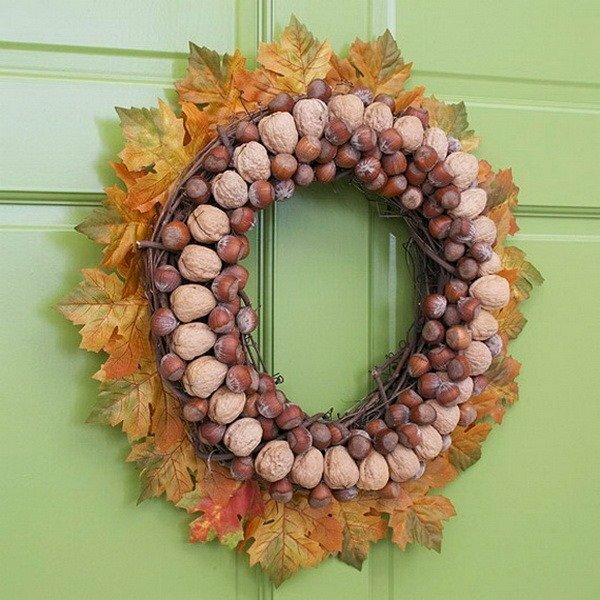 Make sure that the acorns are tight to each other and cover the surface of the wreath completely. If you want a glossier look, use some transparent spray paint and spray it on the acorns. 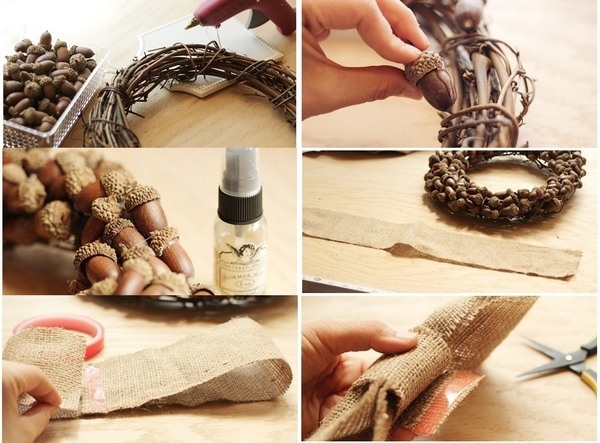 Cut a strip of burlap and make a bow, attach it to the wreath and you are ready to decorate your front door, house walls, or fireplace. 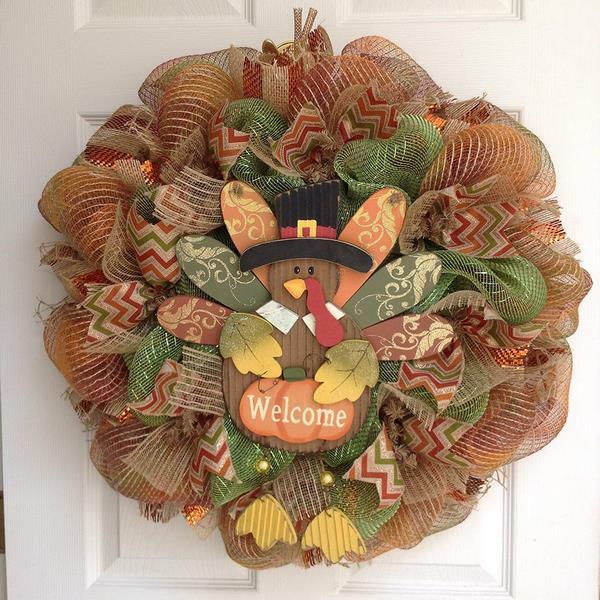 In the gallery below you will find other beautiful ideas to craft your own unique wreath for Thanksgiving. As we already said many times, there is no limit for creativity and original ideas so you can find a lot of inspiration in the photos. Choose the model that you like best and take a stroll in the park in your neighborhood, look around in the backyard for some leaves, dry twigs or evergreens, check the boxes in the attic for pieces of textile, ribbons, yarn, use the twine that you keep in the garden shed and anything else that you have at hand. 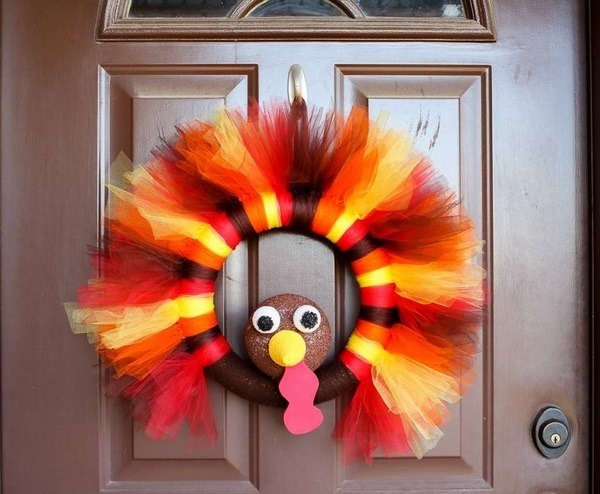 We are certain that without much effort you shall have the best thanksgiving decor – the one that you made by yourself! 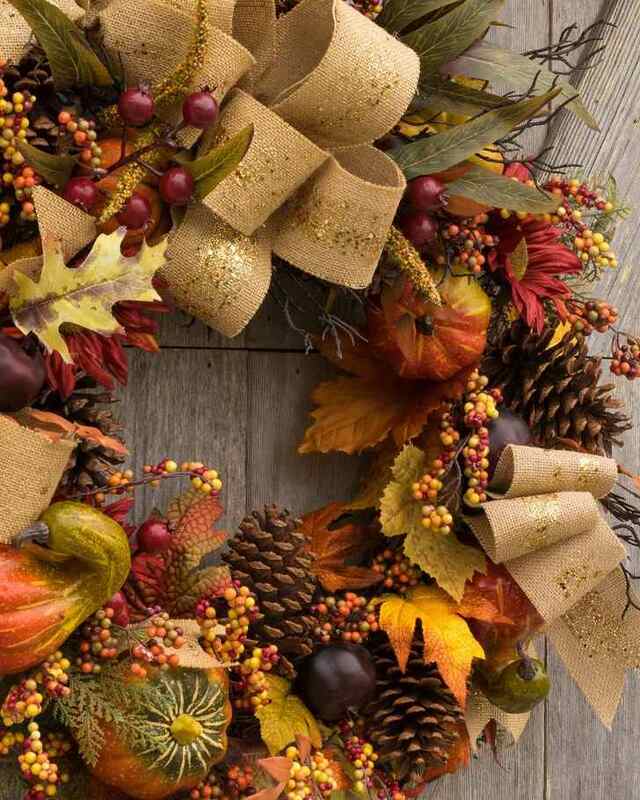 The post Craft a beautiful wreath for Thanksgiving to welcome the holiday season appeared first on Deavita Interior design and Architecture Magazine.